Medical malpractice insurance rates rose dramatically during the past five years, but the amount insurers paid out in claims did not, according to a study from a consumer advocacy group. 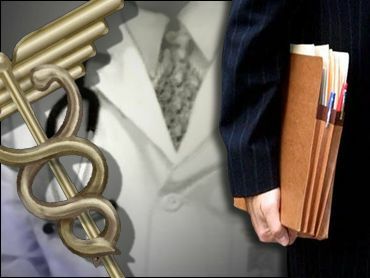 The study, released Thursday by the Center for Justice & Democracy, found that malpractice rates increased by 120 percent from 2000 through 2004, while the amount of money paid in claims went up by 5.7 percent. "This is wacky," said Jay Angoff, a former insurance commissioner in Missouri and the primary author of the study. "Now what's the insurance companies' defense to this?" Researchers looked at annual statements filed with state insurance departments by the nation's 15 largest medical malpractice insurers. The report also found that the leading insurers increased their surpluses — the money they have after setting aside what they will need to pay claims in the future — by a third. "The extra cherry on top for the industry, and the extra knife in the gut for doctors, is not only did claims payments go down ... the companies also added to their surpluses," Angoff said. Insurers were critical of the study's methodology, saying that it only considered the amount paid out to plaintiffs. Larry Smarr, president of the Maryland-based Physician Insurers Association of America, said if other costs — such as money paid to defend claims had been included, the report would have painted a much different picture of the companies' finances. Because it takes time for claims to materialize and be paid, companies must collect premiums based on future cost expectations, he said. "We know it takes on average 4 1/2 years from when an accident happens until a claim is paid," Smarr said. "Comparing the premiums collected today with the claims that were incurred as long as 10 years ago is a totally inappropriate comparison." Agnoff dismissed that argument, saying that projected costs for claims have also decreased. Consumer advocates and some public officials said the study has the potential to recast the often bitter debate about who is responsible for rising malpractice rates: doctors, trial lawyers or the industry. Connecticut Attorney General Richard Blumenthal called on the National Association of Insurance Commissioners to review the study, and suggest legislation. Connecticut's legislature passed a bill this year that would require the state's insurance commissioner to approve most rate increase requests. That bill awaits the governor's signature. Other measures, such as providing refunds to doctors who have been overcharged, and allowing surpluses to be considered when setting rates should also be considered, Blumenthal said. "Clearly the numbers underscore the need for much tougher and much more aggressive oversight to prevent and punish profiteering," he said. Susan Cogswell, the state's insurance commissioner, said officials hadn't gone through all of the report, but said it provided a "distinct, different" look at the market. There were once 19 malpractice insurers writing policies in Connecticut and now there are three, she said. "All I can say is the information that's coming out of the report certainly is not consistent with what we've been seeing in the marketplace," she said.